Are you looking for an electric water heater that can provide hot water fast, reliable and in endless supply, yet it is small and look nice? The manufacturer of Ecosmart electric water heaters might have a solution for you. Either you are looking to buy an electric water heater for an apartment, cottage, office or a house, which has to supply enough hot water to one or multiple fixtures on demand, Ecosmart manufacturer has it; whole-house and point-of-use (POU) tankless water heaters. Ecosmart also offers models that are used as the water tank booster for instant hot water delivery, also as the solar backup and for radiant and pool heating. The above water flow shows two values, calculated with the incoming water temperatures of 40 F and 80 F.
* the number of baths where one unit can be used depends on the incoming water temperature or the region where the unit is installed. Due to its tank-less design, Ecosmart electric water heaters can be installed easier than tank-type units. Lightweight and small size of maximum 17" x 21 x 3 3/4" allows simple wall mount so the floor space in one household is not occupied, especially if it lacks in space. All the models can be installed indoor, under the sink, in the cabinet or above the water fixture - so hot water can be supplied at the point of use, quickly with the reduced heat loss. The outdoor installation is also possible, but only in the protective enclosure. 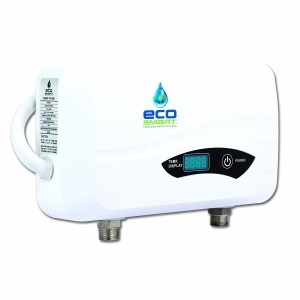 One of the main features that are built in the Ecosmart electric water heaters is the patented Self Modulating Technology using the water flow and temperature sensors combined with the unit's computer, so models do not operate ON/OFF, but with the modulation. If there is no need for the full power, the computer control system will reduce the power to the heating elements, so water is heated to the set temperature with the maximum efficiency of close to 100%, saving the energy and on energy bills. Control panel allows the user to control the outlet water temperature in the range from 80 F to 140 F in 1-degree increments, and which can be seen on the screen above the control knob. 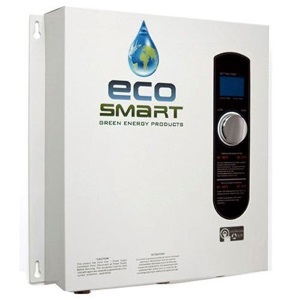 For the proper operation and safety of the user, Ecosmart electric water heaters are equipped with the protection against high temperatures utilizing the auto-reset thermostat switch and the unit's computer. The number of heating elements varies depending on the model, and it goes from one element for the ECO 8 model to four heating elements for the largest ECO 36 unit, all operating on 240 V and single phase. Other differences include the position of the inlet and outlet water connections which are located left and right of the ECO 8 and ECO 11 models and at the bottom for other models. These two, designed as the smallest whole-house models, also include the stainless steel heat exchangers (POU models also), while other have a copper type HE. The above water flow shows two values, calculated with the incoming water temperatures of 37 F and 77 F.
* the number of fixtures where one unit can be used depends on the incoming water temperature or the region where the unit is installed. Ecosmart electric water heaters for the whole house heating come with a limited lifetime warranty while POU models have one year warranty.